The annual Diocesan Chrism Eucharist took place on Maundy Thursday, 29th March in the Cathedral Church of Saint Fachtna, Rosscarbery, County Cork. 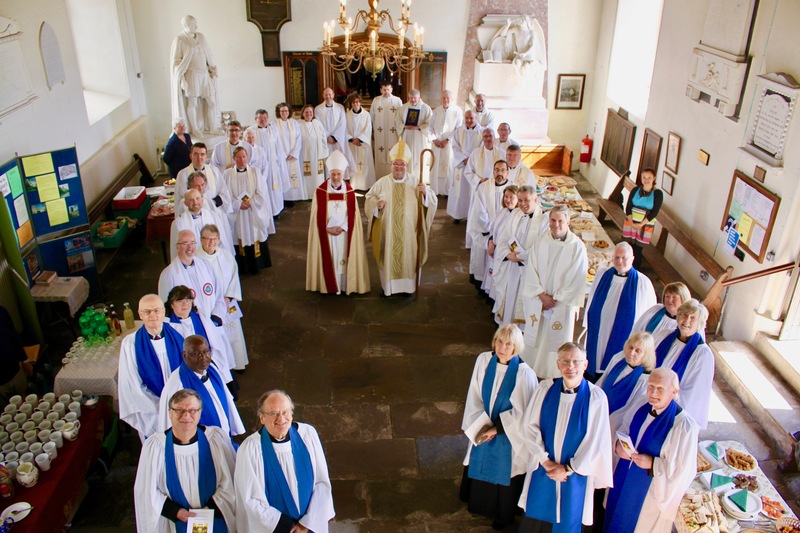 The preacher this year was the Right Reverend David Chillingworth, former Bishop of St Andrew’s, Dunkeld and Dunblane, and former Primus of the Scottish Episcopal Church. Bishop Chillingworth was visiting the Diocese to preach at the Holy Week Services in the Parishes of Douglas Union with Frankfield. 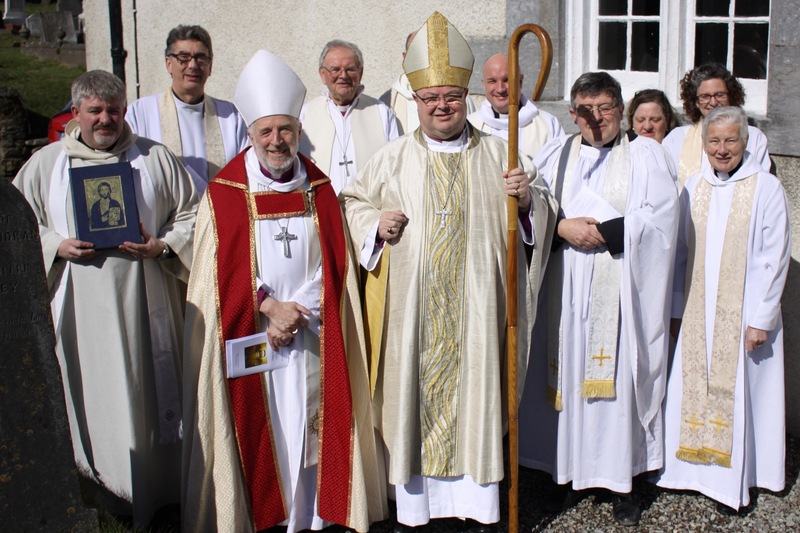 The Bishop of Cork, Cloyne and Ross, the former Primnus of the Scottish Episcopal Church, with the Cathedral Chapter, and other clergy before the Service. As ever there was a very full turnout of lay church workers from Cork, Cloyne and Ross, clergy from the Diocese, visitors on holiday, and people from the parishes. The Bishop, the Right Reverend Dr Paul Colton, presided. During the Service the oils for use in the pastoral, liturgical and sacramental life of the Diocese for the year the ahead were blessed and consecrated. Lay church workers and clergy alike renewed their commitment to ministry. The gifts for the celebration of the Eucharist were brought forward by the Diocesan Secretary (Billy Skuse), the Assistant Secretary (Susan Perrott), and the Diocesan Youth Officer (Hilda Connolly). The oils were brought forward by those who are involved in chaplaincy ministry in the Diocese as well as in the training of lay and ordained people: the Reverend Anne Skuse (Chaplain, Bandon Grammar School), Canon Dr Daniel Nuzum (Healthcare Chaplain and Clinical Pastoral Education Supervisor), and the Reverend Bruce Pierce (Director of Education at Northridge House Education and Research Centre where, among many courses, CPE is delivered in the Diocese). Peter Stobart, Director of Music at St Fin Barre’s Cathedral, Cork and Director of the Diocesan Church Music Scheme, was the organist. Afterwards everyone remained in the narthex of the Cathedral where a light lunch was served. The it was homeward bound to begin the liturgies of the Paschal Triduum on Maundy Thursday evening. At the conclusion of the Service – the readers and clergy of Cork, Cloyne and Ross with Bishop Colton and Bishop Chillingworth in the narthex of the Cathedral, and lunch is ready to be served! This entry was posted in Bishop, Cathedral, Chrism Eucharist, Church Services, Clergy, Diocesan Youth Officer, Diocese, Healthcare Ministry, Holy Week, Lay Ministry, Maundy Thursday, People from the Diocese. Bookmark the permalink.